“The skin of snakes is often a point of curiosity among those who observe them. Unlike many other animals, snakes shed their skin on a periodic basis. While other creatures may simply shed skin cells or hair, a snake actually rids itself of its skin in one continuous piece, a procedure that can be likened to removing a sock. This shedding is not without purpose. Snakes shed their skin to allow for growth, as well as to remove parasites along with their old skin. What about humans? If they shed their skin, do they become Gods? According to the Aztecs, the answer is yes, under the right circumstances. And with that, I give you Toci…..
Toci’s birth into the world is filled with all the markers of a suspense/horror film. Legend has it that way back the Mexica worked as mercenaries for the Culhua. The ruler of Culhua gave his daughter to the Mexica so that she could marry one of the Mexica nobility. Once delivered to the Mexica their primary deity Huitzilopochtli, the god of war, ordered that the woman be flayed and sacrificed. When the Mexica did this, the goddess Toci was born. 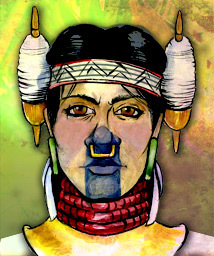 She became the first female deity to the Mexica. The Mexica were driven from Culhua by the ruler and shortly after founded Tenochtitlan, which later blossomed into the Aztec empire. From these bloody beginnings came Toci, the Aztec Mother of the Gods, a complex mother/fertility deity that also is identified with war. I assume that’s due to her relationship with the god of war Huitzilopochtli who ordered the sacrifice that culminated with her birth. Toci was worshipped during the harvest. Typically a young girl was sacrificed by tearing out her heart and flaying her. Her skin was later worn by a priest. And as further proof that Toci is perfect for some sort of horror/suspense film, I stumbled across “Toci: A Mexica Tale” (could freak you out, click with caution).